It’s the 32nd Annual Shades of the Past hot-rod roundup at Dollywood’s Splash country, all day Friday and Saturday, September 5-6, 2014. This year again hundreds of gleaming automotive paint jobs will be on display, with shiny performance engines growling and snarling, at times. The site is a huge paved parking lot with grassy areas and trees all around. This is family fun for all ages, with indoor restrooms and no alcohol permitted. Whether you’re a rod fan or not, you’ll get a kick out of all the activities involving so many beautiful cars from the past. Numerous prizes will be awarded Saturday late afternoon to the participants competing in many categories such as Best Street Cruiser, Best Street Rod, Mighty Muscle Picks, Top 25, and Best of Show (chosen by the Top 25 winners). The 2nd Prize again this year is $10,000, and there’s only one thing that can top this as 1st Prize – drumroll please – of course it’s a ’32 Ford Hi-Boy Roadster, the famous “Deuce” of legend, one of the most sought-after cars in the great American practice of hot rodding. The 1932 Ford was simply beautiful, and you can see it for yourself at Shades of the Past. 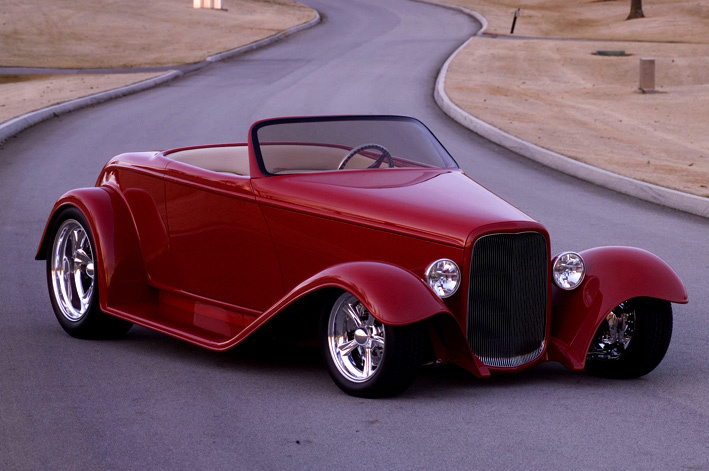 The Roundup prize is custom hand-built every year by Bobby Alloway’s famous Hot Rod Shop, right here in Tennessee. As usual, the sprawling Vendor/Swap Meet is active both days, for those rare parts and accessories, and to meet other enthusiasts. And the 2014 AMSOIL Street Rodder Road Tour this year again makes its long-anticipated stopover in Pigeon Forge, a caravan of special cars on the road, this time on its way from a Deusenberg gathering in Indiana, to the NSRA Nationals in Michigan. See the Shades of the Past web site for details on where to park free and walk, or park paid and be right there. You can also park free in Pigeon Forge and take the trolley into Splash Country. And there are scooter rentals available at the event gates. Also tune to King of the Oldies radio station, 102.7 FM, for the show’s music and information.